The Bistro, Osborne Road, Southsea. <?xml:namespace prefix = o ns = "urn:schemas-microsoft-com:office:office" />The Bistro, previously called the Keyhole, a coffee bar few yards away from Kimbell's. 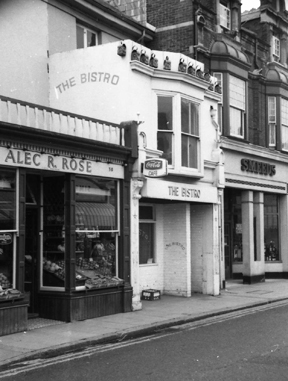 Next door was the grocery shop of Sir Alec Rose, the solo round-the-world sailor. Alec had a passion for sailing and wanted to sail single-handed round the world in his 36' cutter Lively Lady. After much preparation he left Southsea beach on July 16th 1967 to fulfil his dream and returned 354 days later on July 4th 1968. After watching bands with their gear I went to the nearby Keyhole where the rockers congregated at the far end of the coffee bar, the mods hung round near the door, most wore PVC macs or combat jackets, flares, cuban heels and blue shirts with with detachable collars, handy because I was in the RAF cadets so could use the blue shirt with a collar borrowed from my fathers draw. A pin table and juke box sat half way down on the left hand side, 'Green Onions,' '24 hours from Tulsa,' and Roy Orbison played continuously. To get to the tiny overflowing toilet it was necessary to pass through the forest of leather jackets, so a strong bladder was an advantage when visiting the Keyhole. I was ejected from the Keyhole and told not to come back after an incident that wasn’t my fault when I had put my glass of orange on a plywood box on the wall near to the window and someone knocked it over, the plywood box turned out to be the cover for the electrics which got soaked and blew the fuses.